The guesthouse has four bedrooms with different style; two overlook the garden and the Morabito Art Museum, the other two front beach facing the park and pool view. Each guest room has its private terrace and en-suite bathroom. 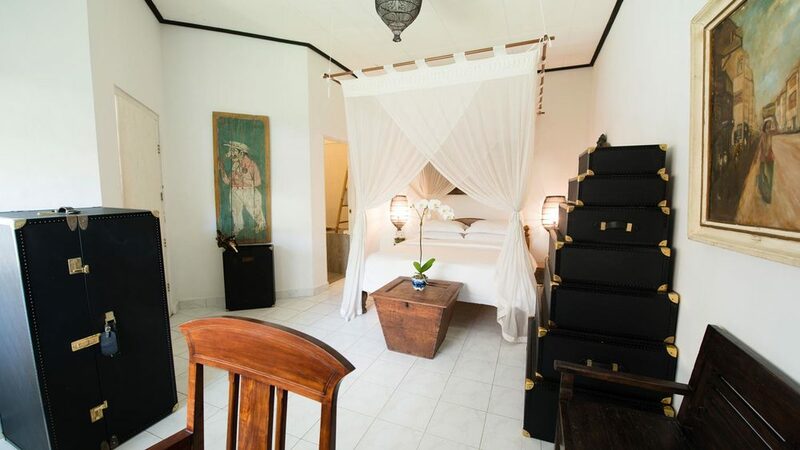 Bali room, Malaka room, Orchid Room, Java room (40 m2 each): Queen bed rooms and en-suite bathroom, Terrace, Individual controlled air conditioning, Hair dryer, in room safety box, Mini-bar. The Guest Pavilion, composed of two bedrooms, has a beautiful view on the tropical garden and the Morabito Art Premier Museum. The two bedrooms are interconnected upon demand. Butterfly and Dragonfly Bedrooms (50 m2 each): with Queen bed room and bathroom, Terrace Garden view, Individual controlled air conditioning, Hair dryer, in room safety box, Mini-bar.